2017 has been the year of M-Sport, a fan-favorite World Rally Championship team that’s currently beating big-budget factory rally efforts from Toyota, Citroën and Hyundai. But Ford won’t make M-Sport a full works team despite all its success, and now one of M-Sport’s most loyal drivers is leaving. Toyota Gazoo Racing announced today that Ott Tänak and his codriver Martin Järveoja will drive for them in 2018. 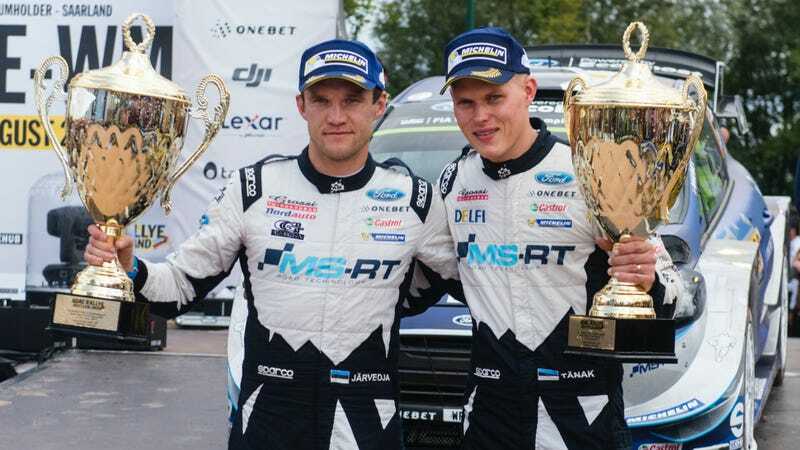 Tänak and Järveoja are currently the second-place duo in the drivers’ and codrivers’ world championships, only behind their M-Sport teammates Sébastien Ogier and Julien Ingrassia. This is fantastic news for Toyota, as Tänak replaces underperforming older driver Juho Hänninen on their three-car works effort. Tänak’s first race with the squad will be the season opening Rally Monte Carlo. Fast Finns Esapekka Lappi and Jari-Matti Latvala will stay with Toyota next year, ensuring that Toyota still has the most fun to say names to say in rally. Additionally, Hänninen’s codriver Kaj Lindström will be sticking around as the team’s sporting director starting at Rally Australia this year. Hänninen is expected to miss that event, Motorsport.com notes. If Toyota’s new-for-2017 Yaris WRC cars more reliable next year, holy crap, this team will be amazing to watch. Rally legend and Toyota WRC head Tommi Mäkinen has had his eye on signing Tänak for a while, and if anyone would know how to dominate in the WRC, it’s that guy. Yet one team’s great get is terrible news for another. Tänak has also been around M-Sport since 2009, coming up through M-Sport’s development program with M-Sport owner Malcolm Wilson as his own personal mentor. It was previously believed that Tänak would stick with M-Sport in 2018 given the amount of loyalty they’ve shown the young Estonian driver in his career. It is with a heavy heart that the team say goodbye to Ott and Martin who have been such an important part of our success this year. There’s arguably been no other driver who I have put as much faith in – or given as many chances – but I recognized his potential straight away. He has always been quick. From the moment he first came to my attention there was no doubting his speed, and in recent years he has developed into the full package – a rally winner and a potential championship contender. It’s not easy to say goodbye, but it’s time for Ott to experience pastures new and we wish both him and Martin the very best for the future. Until then, there remain two very important events and I know that Ott and Martin will be giving their all to end their time with the M-Sport family on a high. If Tänak of all people can be convinced to leave M-Sport next year—to a team he’s soundly beating in the championship, no less—this can’t mean good things for the future of M-Sport. It’s heartbreaking to watch the WRC’s silly season unfold at this point knowing that Citroën has also made it their mission to hire away current championship leader and reigning four-time WRC champ Sébastien Ogier. I love underdogs, and I love to see underdogs’ hard work lead somewhere—to more support, bigger budgets and more championships. While it’s a pretty solid bet that M-Sport will win the WRC teams’ title this year, it feels like I’m reading the sad-upon-more-sad Joyce Carol Oates novelization of what happens next instead of watching the Disney film adaptation where everything works out for the better in the end. Why can’t real life be more like those stupid garbage feel-good sports films we watched askids? The Mighty Estonian Rally Ducks has a good ring to it.